If the mouse is too far from the keyboard, you will end up reaching forward, causing back and neck pain. Working in this position for prolonged periods results in forceful stress on the shoulder and arm and increases the likelihood that you will inherit awkward wrist and shoulder postures, which may lead to musculoskeletal disorders. • Position the mouse closer to the keyboard so you maintain a straight and neutral wrist posture. You may need to adjust your chair and keyboard. • Use a keyboard without a ten-key pad, which leaves more room for the pointer/mouse. • Use a mouse pad with a gel rest for added comfort and neutral wrist posture. • Install keyboard trays that are large enough to hold both the keyboard and mouse. • Substitute keystrokes for mousing tasks, such as Ctrl+S to save, and Ctrl+P to print. Poorly designed mouses and pointers can increase excessive force and awkward postures. For example, a mouse that is too big or too small may force you to add excessive force and/or bend your wrist into awkward positions. 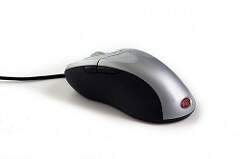 Using the left hand to operate a right-handed mouse may also result in posture problems. Select a mouse that is designed to fit the shape of your hand comfortably. There are right/left handed mice available. A device that is designed for either hand use may be desirable, since changing from right- to left-hand operation provides periods of rest for each hand. Using keyboard functions, such as CTRL+P (print) or CTRL+T (new tab), may reduce mouse use and provide rest for hand and arm muscles.